The Hello Spring range from Little Yellow Bicycle definitely makes you think of spring with all their happy vibrant colours! 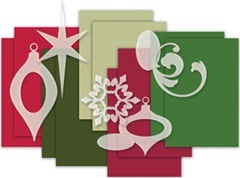 Chris has created the following three cards using the 6x6 paper pad, clear cuts, jewels and cardstock stickers. On the white card backgrounds the colours certainly POP! 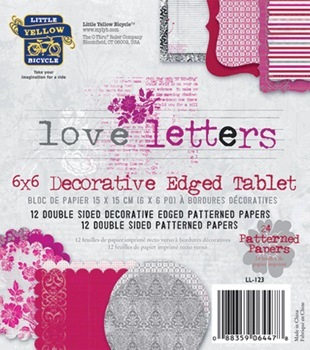 Little Yellow Bicycle has it all... papers, embellishments, albums, stickers, the works!! Iris has made it a habit of creating albums in advance for future events. This makes it much easier for her to complete a themed album as all she has to do next is print the photos and attach them. When it comes to creating mini albums, Little Yellow Bicycle products are some of the items she immediately looks for because everything has already been coordinated. Iris made this for a coming trip to Europe with her husband. With the hundreds of pictures she is sure to take, this ready made album will really be a time saver for her. The talented Corrie Jones is responsible for this energetic grid-based back to school page using the new ‘Makin’ the Grade’ range, recording one of the hardest moments – her youngest starting school. We loved how LYB’s Biker chick Lisa Swift layered, overlapped and clustered her embellishments on this page, still making sure that photo remains the focus. She has used the Acorn Hollow line with its bright autumn colour palette. Recently Miriam Prantner found herself with a strip of left over pattern paper from the Little Yellow Bicycle Hello Spring range, she used it to create this gorgeous set of cards. Here's what Miriam said "It's such a cute little scene, and I thought it would be perfect to cut up for a set of cards. The paper really didn't need much. I just added some Hello Spring embellishments and a few trims." We love how she has even stitched around the clouds in one of the cards. We just adore this set Miriam, thank you so much for sharing your process with us! Sue adored the colour palette of LYB Paradise collection. It matched photos of Sue's husband and daughter perfectly. 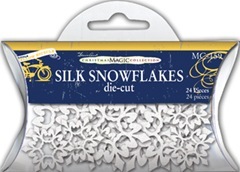 Sue used the Paper Flowers Kit to embellish her page and she really loved the rosette strips in the kit. 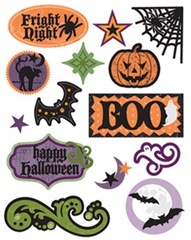 They come die-cut and pre-scored for you so all you have to do is make them up and add embellishments to the top. Sue also added in a cream wood grain Hambly transparency and beautiful felt leaves from Prima. In Kim's opinion the red , white and blue colours in the Saturday's range makes this a perfect choice for scrapping photos of boys. Although the range comes with a paper flower kit, this kit includes the makings for the great pinwheels that Kim has included on her layout. 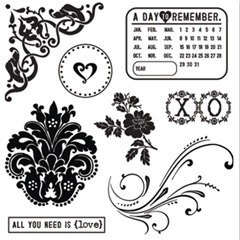 Kim has also layered lots of the different elements available in this range, such as the decorative edge 6x6 cardstock, stickers and the tear out tickets, to complete this layout. Corrie Jones created this page about her hubby using the Saturdays collection from LYB. The colours of red, blue and cream suited Corrie's photos perfectly. 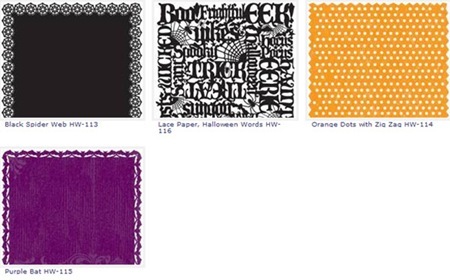 Corrie loves the textured papers and found them great to work with. Thanks Corrie for allowing us to share your page! 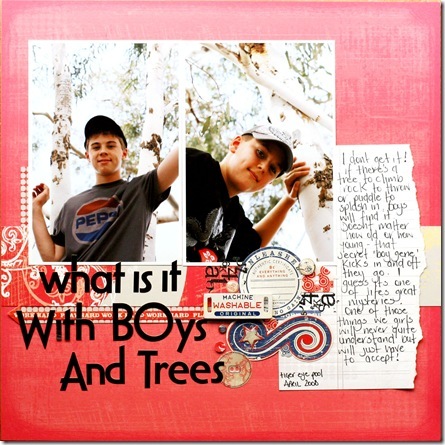 Shellye McDaniel has made this beautiful album using the Little Yellow Bicycle Saturdays range. She has based the album on the decorative edge 6x6 cardstock pieces which are just perfect for a project like this as they are heavy weight and double sided with a different pattern on each side. Shellye has then embellished the album using a variety of embellishments from the many that are available as part of this range. 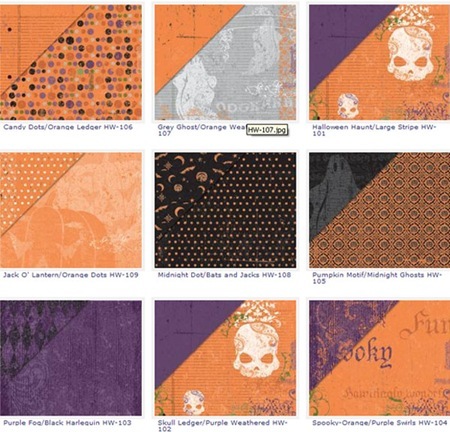 The following projects were all designed by the talented Izzy Anderson using the LYB Paradise collection. Izzy has used one of the scalloped mini papers and attached it to a card base. 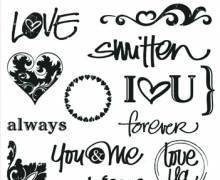 To create the sentiment for her card, Izzy used lettering stickers adhered to a die-cut and then added a hand cut heart and one of the cute little envelopes from the '5 things' embellishment set. 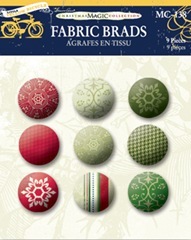 Izzy loved the plaid paper in the Paradise collection and it reminded her of the pants golfers sometimes wear. Hence the cute photo of her own little golfer! 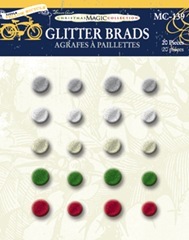 Izzy loves all of the embellishments that LYB makes and has made use of them on her page. Finally this beautiful project is created by Izzy using the Medley album in the Paradise collection. 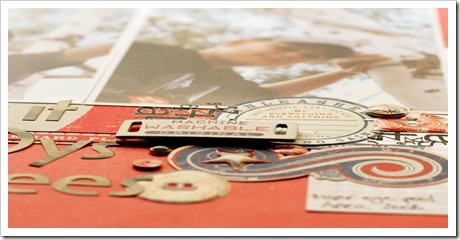 The album comes with an assortment of tags, envelopes and inserts and comes with instructions and color photos to show examples of ways to put the album together. It's easy to follow along with the suggestions or you can do your own thing. Izzy used the album to document a trip her family took to the beach just after her son turned 1 and added several embellishments from the Paradise collection. Leeann really enjoyed creating this page; it was the perfect opportunity to reflect on the events that have taken place through out the year. Some of which Leeann still has to scrap. Leeann decide to use a heap of photos but instead of highlighting them all she threaded them all on some twine and randomly bunched them up and placed like so. She added a few sentiments from some of the events that had taken place for future scrapping reference. Leeann has used a mixture of paper and embellishments from little yellow bicycle, the fall collection. 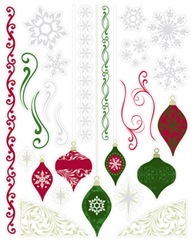 Three new paper lines with inspired embellishments and accessories. 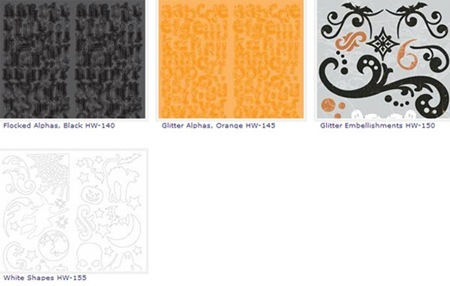 Check out their Canvas Colorables. See the full release here. Because the papers of the Elizabeth line had so much to offer, Iris chose to cut-out the patterns and use it to embellish this happy colourful page of her two daughters enjoying a day out in the sun with their pink bike. This collection also has the cutest ready-made embellishments according to Iris, like the colourful bunting and the 3d butterflies. Beautiful patterns, stunning colours, fabulous embellishments ... if that is what you are looking for, Iris suggests you grab some of the new Little Yellow Bicycle "Elizabeth Park" line. Iris has worked with several LYB releases but this so far is her favourite of all the lines released. Carole loves the new collection by Little Yellow Bicycle Babysaurus, just so gorgeous and the colours are so soft and delicate. 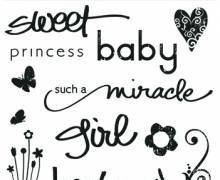 The stickers, rubons and borders are just perfect, and the added extras such as the Chipboard Slider just make it all the more special for the gorgeous baby photo layouts that you want to create and share. Carole also created a cute baby plaque and card, just because she could not stop using this gorgeous collection. 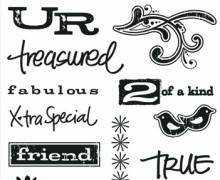 When Candace Harrison saw the "10 Things Pocket" and the "Favorites" glittered chipboard piece, she thought they would be perfect to use in capturing her kids thoughts and likes, right now, at ages 7 and 11. She used a quiz from Simple Scrapbooks "Scrapbook Shortcuts with Quizzes and Questions" and recorded each of the answers on the 10 pocket tabs. The LYB Twig line was perfect for this "everyday layout" and she even repurposed some of the paper backing from an embellishment pack for the title backing. Liz Qualman shares with us this layout which features a photo of her daughter playing around at the park. Liz thought that the Elizabeth Park collection with lovely shades of pink and images of fluttering butterflies perfectly captured the whimsical nature of her little girl. 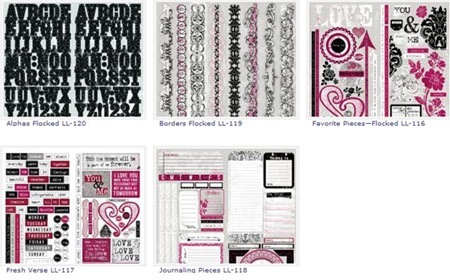 She especially loves the canvas sticker borders with the pink polka dots and decorative edge. Attaching them to the top and bottom of her page really creates a fun focus on the photo. 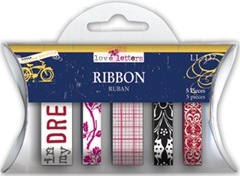 Five new lines from Little Yellow Bicycle full of bright colours and whimsy that they do so well. Iris used Little Yellow Bicicyle SnuggleBug Girl patterned papers and embellishments on both this and the next delicately created layouts. 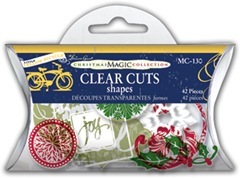 Here she cut-out trees from patterned paper make for a fun and whimsical page. On this layout Iris made use of the stripe patterned paper and cut off the ends to make it look like ribbon strips... a fun and quick way to create a base for your photos. 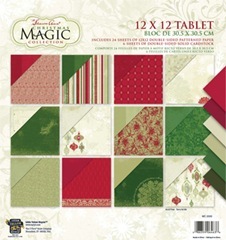 A self-confessed patterned paper junkie, Kathie sometimes comes across pieces that are just too perfect to cut. The Stroll in the Park paper that she’s based her layout on here, is one such paper. She’s used it pretty much as it came (and sighed sadly whenever she had to cover one of the images on it with other page elements). The Snugglebug Boy range is wonderfully fun and vibrant for pages about small boys. 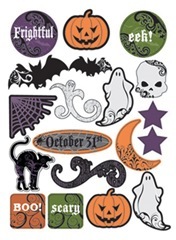 Kathie used the images from the sticker sheet and rubons to make decorating her page a cinch. Suz used the gorgeous greens and blues of the ‘Lucky Me’ range to create this fabulous little mini album of her son’s homage to the scooter and skateboard. 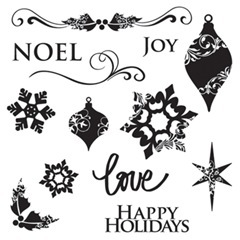 In addition to all these papers in a 12x12” size and the co-ordinating embellishments (here Suz has used epoxy buttons and rubons) there is also a paper pad which is pre-cut to just pull out and cover a chipboard mini album – so all the hard work is done for you! 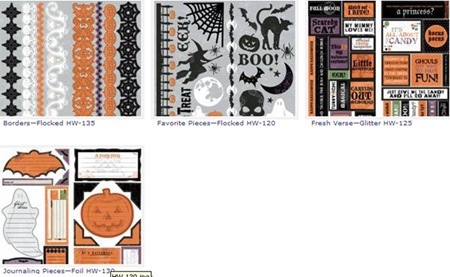 This pad includes plain papers as well as patterned die cut ones and a sheet of perfectly themed stickers. The ‘Lucky You’ theme is extraordinarily versatile and would work with a great range of photos. Suz notes that the most time consuming part of this album was finding two years worth of photos of her son’s scootering obsession. Romy Veul from Uithoorn, Holland has created this card using the Snugglebug boy range. She tells us that the card was actually a quick and simple one. She cut the trees and animals from the patterned paper and layered them using foam tape to create this super sweet arrangement. To give her card extra charm and dimension, Romy’s created white dots using liquid pearls and decorated everything with gloss and stickles. We love the length of spotted organza she’s tied across the bottom of the card too. 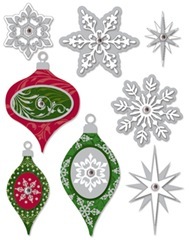 Three new lines including a beautiful traditional Christmas one. Click on each image to see them in more detail. 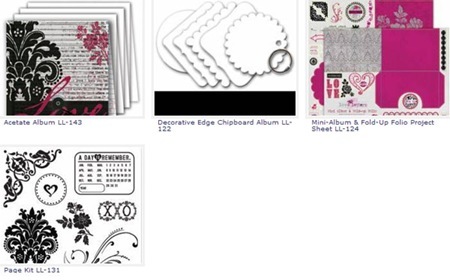 Scrapbooking product needs to grow up before our very eyes along with our children, and for those of us who started out with moons with faces and paper pieced teddy bears 6+ years ago for our toddler pages, are now starting to need designs a lot like these ones. Little Yellow Bicycles Generation Z product range include ‘awesome’ papers, stickers, 3d stickers and alphas designed for the skate park, the bmx track, the guitar hero loving tween or teen in our lives. 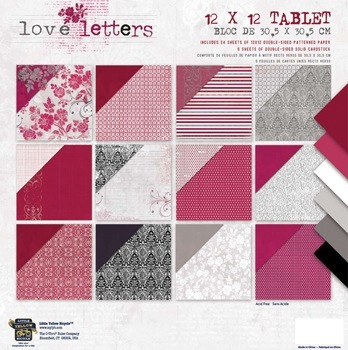 Suz loved this range and so did Alex – it’s the first time he’s shown an active interest in scrapbooking himself as she lost the fabulous blue and silver checkerboard paper in the line to his graffiti/art. When he finishes she’ll probably swipe it to add to his album. Shhh! don't tell Caz's son Jesse that she has really put a flower on a layout with his blokey looking birthday photos, she told him it was a swirl. lol. Caz hangs onto some of the more funky looking tags that come off her kids clothing just for times like this. The Bad Bay tag really suited the pictures and when paired with the blue in Jesse's shirt, matched the Lucky Me range by Little Yellow Bicycle perfectly. 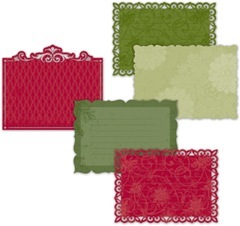 The Lucky Me range has some of the most gorgeous rich coloured papers and accents. Many of them made even more special with hints of gold through them. Caz decided that the Generation Z range from Little Yellow Bicycle was the perfect range for this simple album she has created listing her sons accidents and hospitalizations so far. The paper tablet was the perfect place to start. Caz used the cardboard from the back of the paper tablet as her front cover. Covering it with one of the papers she then added a vinyl cut-out, a dimensional sticker and one of the journaling spots. To create the pages she simply folded each one over at the bottom and stuck them down so that the pages were different sizes and as they are double sided they ended up with a contrasting bit on the end. Some were left full length and others were cut in half. Journaling spots, stickers, rub-ons and random alphabets completed the pages. And the beauty of this style of album is that you can add plenty of pages as you go. Jesse is only 8 and there are already 6 double pages in the album. Caz is hoping that things may slow down a bit or she will have to purchase bigger hinged rings. We have Greta Hammond from Northern Indiana to thank for these cool layouts using Little Yellow Bicycles new Generation Z range. She has this to say about the products. Gen Z is really a great line with bold colors and patterns. 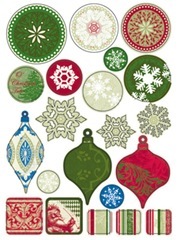 There is a great mix of patterns, shapes and textures in the embellishments. It's very easy to get a number of different looks from this line. For the "Just Be" layout, I combined the clear cut frame over my photo and then started layering other pieces on top. I stuck with the grey/black/yellow colors on this layout to go along with the music theme. For the "Risk Taker" layout, I used another Clear Frame to emphasize my photo and then blended in other clear cut pieces to frame it even more. I chose turqouise and orange colors for high energy feel, a completely different feel from the the previous layout but all within the same line. Caz and alot of the other girls in the design team fell in love with this display of ATC's (Artists Trading Cards) created by the talented Alexandra S.M. from the USA. She has used a 7Gypsies ATC tray and one of the new collections from My Little Yellow Bicycle called LUCKY ME. Seriously gorgeous! Alexandra also created this cute album using the Traveler range from Little Yellow Bicycle. She has created an album with a concertina spine containing pages which act as envelopes. Into these envelopes she has inserted mini pages containing photos and journaling. Thanks for sharing these lovely projects with is Alexandra. Little Yellow Bicycle Autumn Bliss pattern papers and embellishments are beautiful, the colours are gorgeous, and they all go together so well. 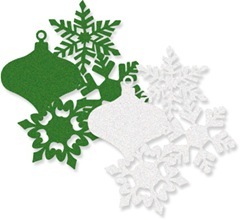 Carole created this cute layout cutting out the leaves to create embellishments around the photo. 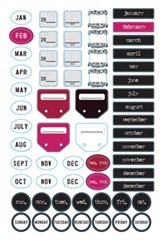 The journaling tags are not just a great way to journal, but also to create little creative pieces on a layout. Carole also used a transparency frame over her photo. 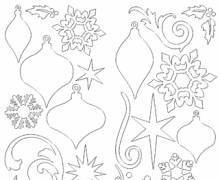 Janine carefully hand cut around the tree and then slit the circular paper to slide the hand cut tree paper through to create a seamless background. Janine also used the gorgeous diecuts from the Autumn Bliss range to frame her two photos and added dimension to the layout by altering Hero Arts flowers. We thank Greta Hammond for this beautiful layout, also making wonderful use of the Autumn Bliss range. And look out soon for samples of LYB’s new CHA releases! After Caz saw the Little Yellow Bicycle 25 Days of Christmas range she decided to make an album that counts down the days until Christmas. Starting at the 1st of December, all the way to Christmas Day, listing things that happen in the household to prepare for the big day. 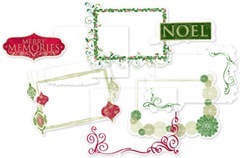 She used only the 25 Days of Christmas papers, journaling spots and stickers, and added a variety of letter stickers, chipboard letters and bling. So far she has covered untangling the christmas lights, making teachers presents, advent calenders, the Christmas letter that she writes each year and the kids letters to Santa. Caz has included envelopes on some pages to contain things such as the letters. She has used a mix of current photos and older photos. She particularly loves the page with the photo of her kids some years ago, posting their letters into Santa's Mailbox. 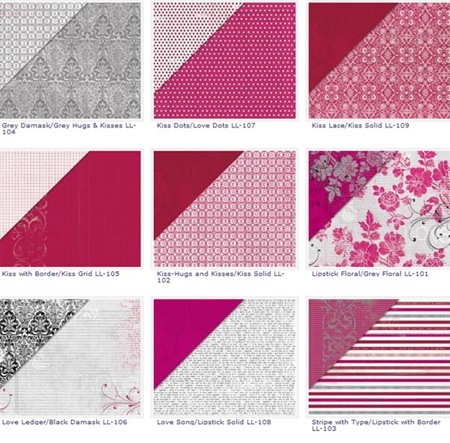 What a fabulous range the new Zinnia is! 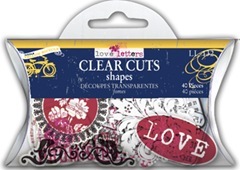 Chris said she rubbed her hands together with glee when she unpacked this range and in particular the amazing lace-cut cardstock which she has used here on her background. 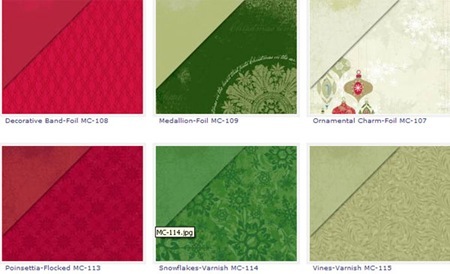 The colours in this range are so wonderfully eye-catching and great to work with Chris says. 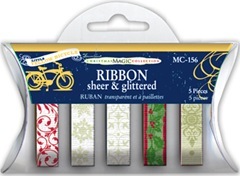 She layered the cardstock stickers and glitter stickers over the lace-cut cardstock to create this colourful effect. The deliciously girly "Delightful" range is perfect for any little (or big) girl project. Combining all of the essential girly elements - butterflies, flowers, flourishes and glitter, it's easy to see where it gets its name from. For this page Nicole chose some of her favourite photos of her little Madeleine journalled a suitable quote in a circle and let the paper range do the rest. The lovely water-coloured background was the perfect base, all Nicole did was add a glittery journal card, some hand-cut flowers and butterflies, Glimmer Misted lace and then used a glue pad to stamp a flourish before sprinkling Pink Paislee Pixie Stix glitter on top. Cute and girly achieved with ease! There has been a population explosion where Jaimie lives and she wanted to create these two cute albums to give as baby gifts. The Little Yellow Bicycle Safari Boy matchbook album is just right for those first photos of baby and the perfect size for Dads pocket for him to show off at work. This very quick album takes minutes to put together with the cover, pages and embellishments all ready to go on the 12x12 page they come on. Jaimie has added some buttons from the range and two brads to secure the album together. Here, Jaimie used a Tinkering Ink peek-a-boo album and teamed it with the new Little Yellow Bicycle - Safari Boy range of papers, ribbon, journaling pieces, transparent frames and letter stickers to create this very cute album just waiting for those sweet baby boy photos to be added. 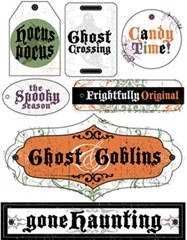 To add the sticker title onto the front of the album, Jaimie adhered the stickers to one of the transparent frames and then cut to fit the width of the album. The title looks as though it is 'floating' on the cover, yet it is secured by the transparent background. Chris felt the Zinnia range also lent itself to an Easter look. She has created 3 different little Easter baskets for you to enjoy and possibly re-create yourself. This tiny basket was made from 1/3 of an empty toilet roll. Chris would like to thank Nichole Heady for this gorgeous little idea. This next basket Chris saw created by Angie Kennedy Juda. This would make a great egg hunt basket for the kids this year. Chris used the Hero Arts Clear Design 'April' stamp for the egg motif on the front. Chris also used Inque Boutique dual tip blendable markers to colour in the egg and she has put together a little tutorial on how to do that here. The template for this basket can be found here. And lastly, this gorgeous mini bucket purse will also make a great Easter basket. You can find the template to create this basket here. Thank you to Mel McCarthy for this wonderful template. 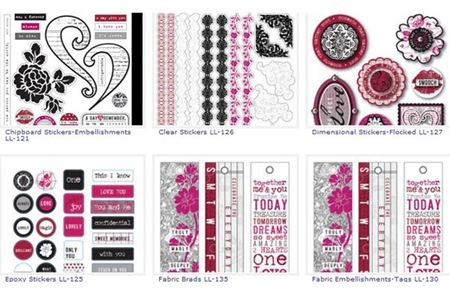 We must thank Tania Willis for this gorgeous layout using the new Zinnia range. Here's what Tania has to say about creating with these papers: "I can't get over how irresistible the new Zinnia collection is from Little Yellow Bicycle. bold.bright.vibrant.color. i LOVE it. this particular paper, the patchwork is complete." Thank you so much Tania for your wonderful creation! The next two wonderful layouts come to us courtesy of Iris Babao who made comment that she was totally delighted to be working with these 2 new amazing lines from Little Yellow Bicycle. First we have this striking layout using the new Zinnia range. We love the way Iris trimmed the Pink Blossom Lace and placed it to the side of her photo and used it as a wonderful embellishment with the gorgeous felt and chipboard flowers placed on top. And once again Iris has worked the Baby Safari line into a masterpiece with this very eye catching layout. We love all the little clusters of embellishments that Iris has created. Thank you so much for sharing your inspiring work with us Iris. We are delighted to welcome Andrea Beaumont to the Aussie blog this week. Andrea is on the Design Team for Little Yellow Bicycle and lives in Canada. Her online gallery has some delicious creations in it and we wanted to share just a few with you starting with this cute little gift card holder created from the "Delightful" range. Isn't that clasp and handle sweet? Andrea also created this adorable flower card holder. It would be a gorgeous gift. Using the brand new Little Yellow Bicycle Safari Boy and Girl ranges from CHA this year, Andrea created these beautiful layouts. 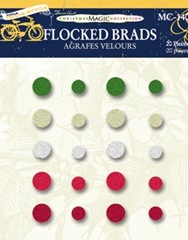 The colours are fresh and the embellishments adorable. 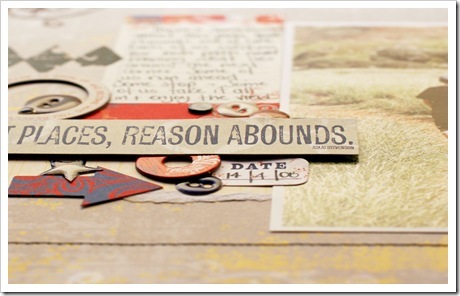 Thank you Andrea for allowing us to showcase some of your gorgeous work here on the Aussie blog. 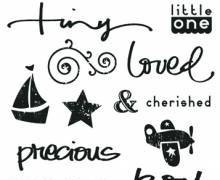 The cool green and blue colour combo, along with the huge range of quote stickers and embellishments make Vita Bella from Little Yellow Bicycle a diverse range easily adaptable to a huge range of themes and photo types. 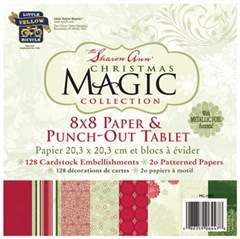 Here Nicole used it on a favourite photo taken by Raylene Wilkinson almost two years ago that had been awaiting the perfect paper and in this range Nic found it! She pleated and distressed the stripes for texture, then embellished the rest of the page with papers, journal blocks, quote blocks, ribbon, stamps, letters and a brad all from the Vita Bella range and also added the white glittery letters from Little Yellow Bicycle's Delightful range. 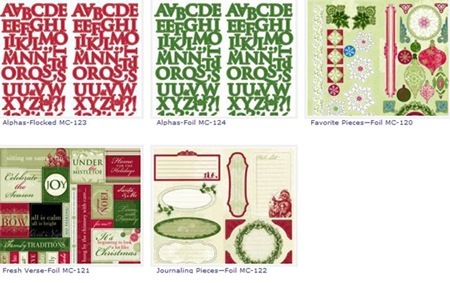 Some of the papers are foiled to give them that added interest and the stamps are absolutely gorgeous. Jaimie says - I love the Vita Bella range so much - it is so elegant and rich. I especially love how it is not gender determined as I struggle to find papers to suit my sons. I couldnt get enough of the chipboard and cardstock embellishments and found it so easy to put together this page, so beautiful. 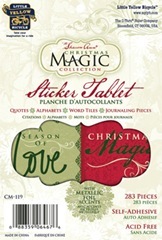 Left overs are always perfect for cards and Jaimie was able to add two more to her card box for future use. With simple layering of the Vita Bella chipboard embellishments and cardstock verses partnered with rubons and pearl brads makes for a lovely and elegant card set. Sometimes as you go to push the button on the camera, things change at the last minute and the photo you were aiming for is not quite what you end up with. Just as Caz went to take a photo of her cat Raphael lazing up against the guitar that the kids had left laying around on the floor, he yawned. Not what Caz was after but the kids said that it looked like Raphy was singing and playing the guitar so the photo stayed. These Little Yellow Bicycle papers and cardstock stickers in the Zachs Life range fit not only the colouring in the photo but also the theme perfectly. Caz mixed a couple of the fabric borders and 2 cardstock stickers (one of which was mounted on chipboard) to make the title block for the layout. Another fabric border was cut lengthwise into 3 strips to create a frame for the photo. As the name suggests the Delightful range by Little Yellow Bicycle is just that, delightful. The colour range is very pretty and made up of sweet pinks, oranges, blues, greens and other soft colours. For this layout Mel has combined the Roses and Plaid patterned papers (which are double sided) and teamed them with Delightful rubons and glitter cardstock stickers to create a page of her neice's new love of looking at beautiful books. This adorable layout by Candice M. Reszko has used the Delightful range of papers from Little Yellow Bicycle and we think you'll agree that the soft, pretty papers go perfectly with the adorable little girl in the photos. The butterflies and flowers add a gentle touch to the layout and we loved the scallops and different layers that Candice added. Denine Zielinski created this funky layout titled 'mismatched winter'. The clever placement of the circles featured on Denine's layout really draw your eye to each photo on the page. 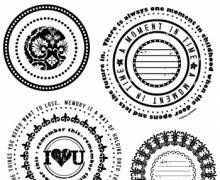 Outlining each circle with mini beads is a fabulous idea and the black beads look striking against the photos. 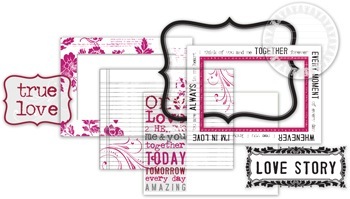 This gorgeous layout by Tania Willis shows off the beautiful Delightful range perfectly! The sweet girly colour palette suits all things cute and feminine, thanks so much Tania! We're very excited to welcome to our post Cindy Tobey, who created this adorable page from the Delightful range. We love it's detail yet elegant simplicity and her very clever use of the die-cut border. Thankyou Cindy for allowing us to share your gorgeous page here. 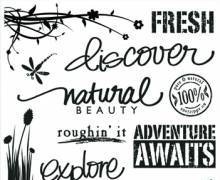 A big thankyou to Renee Foss from Little Yellow Bicycle DT for kindly giving permission for us to showcase her stunning work using the Vita Bella range. THANKYOU Renee! Renee's page is stunning in its simplicity with the rich greens given pop by being layered on the dark blue. The uncluttered embellishments are just the right finishing touch for this beautiful page. 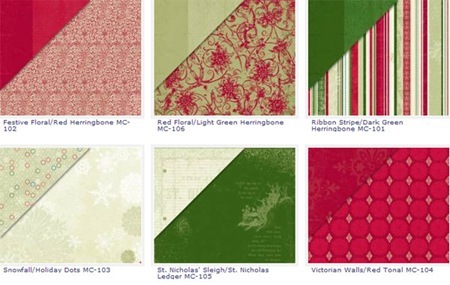 Again Renee shows how each design in the vita bella range matches perfectly - her focus photo is the first thing the eye sees and the colours in the photo are brought out by the gorgeous greens and deep blues on her page. Finally we have to say how lovely this LO is. 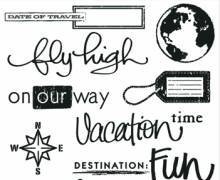 Renee has kept this page simple and uncluttered with just the right amount of embellishments to add interest to her project. 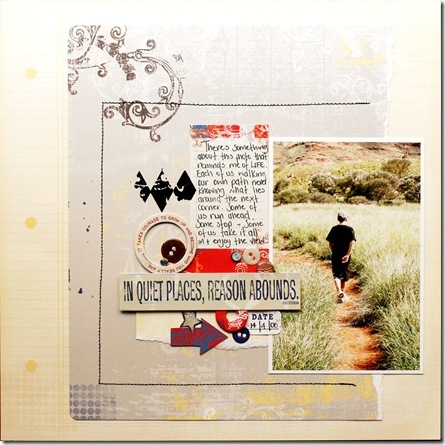 Gorgeous work Renee - thanks for allowing us to share your layouts. We're very happy to be able to show these gorgeous cards by Canadian scrapbooker Jennifer Roach. 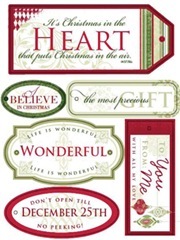 We adore the richness of these cards and how she layered so many beautiful bits and pieces. 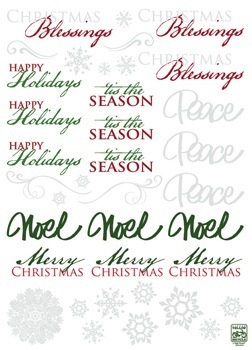 Both cards are tactile and gorgeous and we think whoever receives them will be very excited! Thanks Jennifer. Another gorgeous card by Jennifer Roach, we love how she cut the papers to utilise the printed frame on the paper and then layered the elements within that frame. Fantastic. 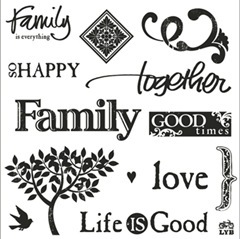 three stunning lines of themed patterned paper and co-ordinating embellishments, and a collection of versatile rubons and stamps. Jaimie is always on the look out for suitable boy ranges that leave the 'cutsie' behind. LYB's new Zach's life range is fantastic and is perfect for scrapping photos of her teen and pre-teen sons. Rich bright reds and deeper blues mixed with splashes of yellow and brown go together perfectly and mix well with the extensive range of embellishments that are offered. Jaimie put this simple LO together by layering the papers and clusters of embellishments finished off with journaling and large title. Subtle is the key word with this paper in the Zach's life range - the soft greys, yellow and hints of blue & brown are low key enough to not take away from focus photos. Jaimie has added 'pop' to the page by the addition of red and blue embellishments. 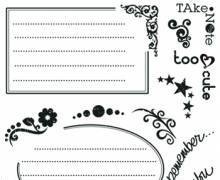 Simple handwritten journaling and the title taken straight from the Chipboard embellishments in the range complete this LO. For those scrappers looking for ranges to cover older boys LYB is sure to fit the bill. Aussie would like to thank the Design Team from Little Yellow Bicycle for giving permission to use these fabulous projects - thanks girls. 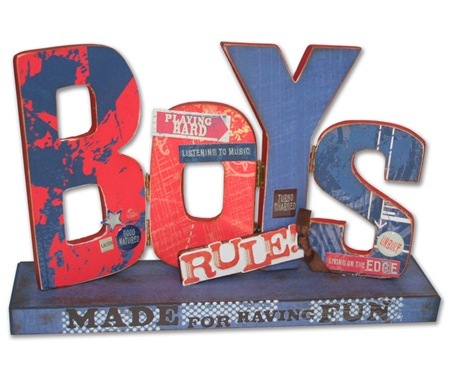 Renee Foss from Little Yellow Bicycle created this amazing sign for boys. Using the paper from Zach's Life as well as the diecut embellishments and stickers she has really made this sign a standout project that any boy would love to own. 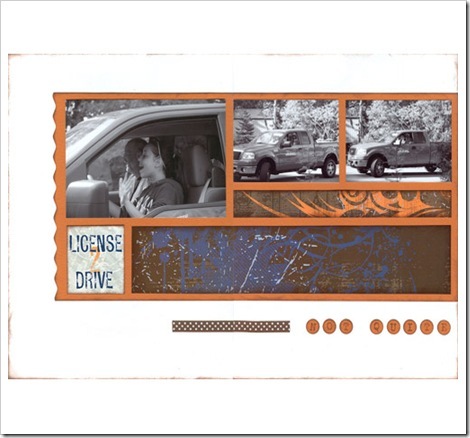 Sue Thomas has created this fabulous LO about almost being ready to drive! The orange, brown and blue combination of the Zachs Life range really 'pop' when combined with the white background. Thanks Sue - this really rocks! Finally - who could resist this LO by Norma Manak. 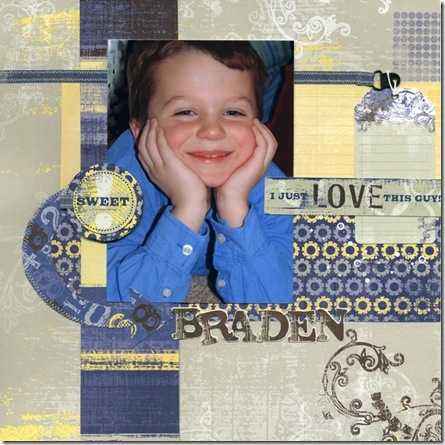 Gorgeous layering of the papers and cardstock embellishments really showcase the photo of this cute little boy. Beautiful.